Healthy fruits taste great and provide valuable antioxidants, minerals, vitamins and other nutrients. Unfortunately, certain fruits eaten in excess can also be a hidden cause of gas, bloating, stomach ache and intestinal cramps for many people. If you are experiencing digestive problems and are wondering whether a certain type of fruit could be the culprit, this page lists the 12 worst fruits for excessive flatulence, belly bloat, tummy pain and even diarrhea. You’ll also find a helpful list of non gassy fruit and a useful process for identifying which fruits cause problems for you personally and a way to still enjoy them without experiencing gas and other intestinal upsets. Not everyone will be affected in the same way by the fruits on this list. Certain problematic substances in apples and cherries for instance may be handled by your digestive system well, while the high fruit sugars in pears or pineapples could quickly causes bloating and gas for you. It’s best to consider the following list of gassy fruits as potential suspects, and use caution when eating large amounts of them, but don’t stop eating a fruit completely until you’ve checked how it affects you using the method at the end of this article. In the number one spot for fresh fruit that causes bad gas and an upset stomach are bananas. Though the level of ripeness of a banana can heavily influence whether they will cause you digestive problems or not. Unripe bananas contain a lot of resistant starch, up to 80% by some estimates. Resistant starch is not digested properly by your body and has to be broken down by bacteria in your intestinal tract. This digestive resistant starch in bananas is often referred to as a ‘prebiotic‘, in that it can feed beneficial bacteria in your lower intestine. But it can also feed bad bacteria in your colon as well, especially if they are in the ascendancy. Generally, bad bacteria will create the smelliest flatulence as they break down the resistant starch from an unripe banana. But all bacterial fermentation of this fruit can create excessive gas. A banana is actually considered unripe not just when it is still green, but right up to a full yellow color. Only when they start to get small brown spots on them are they truly ripe. Before this point, bananas will contain flatulence causing resistant starch. As they ripen this starch converts to simple sugars like fructose and glucose. A fully ripened medium banana will have around 5.7 g of fructose and 5.8 g of glucose, according to USDA nutritional information. Fructose itself can cause digestive problems for some people, but bananas aren’t an especially high source compared to some other fruits. In most cases, if you are experiencing digestive problems like gas, stomach cramps and bloating with bananas, then you probably need to let them ripen further before you eat them. All yellow and not green is not enough to stop a banana causing gas. Try one with brown spots on its skin and see if it is easier for you to digest properly. The good news is that as they ripen bananas increase in nutrient content, particularly potassium, magnesium, vitamin B6, vitamin C and other antioxidants. The bad news is they are high in simple sugars when fully ripe and are not recommended to have too often if you’re trying to lose weight. Eaten in excess, bananas do cause gas for most people, especially when unripe. One fully ripened fruit as an occasional treat though shouldn’t cause too many issues. Eating apples can make you gassy and cause digestive problems like stomach cramps, bloating and even diarrhea, but for different reasons than bananas. The main reason apples cause gas is because they are full of intestinal bacteria feeding sugar alcohols like sorbitol. Sorbitol is a complex string of sugars that cannot be broken down properly in your small intestine. Instead, it passes largely undigested to your large intestine where, in high enough amounts, it causes an osmotic purge. This occurs when water the intestinal wall has absorbed is quickly released back by osmosis in the opposite direction into the colon. The result is watery stools or outright diarrhea and can happen quite suddenly when enough sorbitol is consumed. Even at low levels, sorbitol has to be broken down by bacterial fermentation. When enough gas is produced in this breakdown the result is usually stomach aches, bloating, cramps and a lot of flatulence. Studies have shown that the higher the sorbitol content in an apple, the more people prefer the taste of it. So varieties with the most sorbitol have become the most popular apples to eat. In testing, sweeter red breeds like Jonagold, Braeburn and Fuji apples had the highest levels of gas causing sorbitol, while the smaller and tarter green apples generally contain much less. Sorbitol is actually found in much higher quantities in low-sugar confectionary, sugar-free sodas, low-calorie foods, processed fruit juice and chewing gum. Manufacturers seem to find it a cheap and convenient food additive, but the fact that it is also sold as a laxative at the drugstore should be a good indicator of what it does to your insides when you have too much of it. It’s best to avoid sorbitol is much as possible if you are experiencing an upset stomach, bloating, watery stools or irritable bowel syndrome. The occasional apple makes for a healthy snack and shouldn’t cause too much flatulence for most people. Too many apples or apple juice can easily cause bad gas though, and even diarrhea, so it’s best to moderate your consumption, especially of the sorbitol-rich sweet red varieties. Delicious cherries are a delight to eat but you might want to limit yourself to just a handful to avoid bloating, constant gas and other gastrointestinal issues. Cherries are considered a high FODMAP food, meaning they contain substances known to be a problem for people suffering from IBS and other chronic digestive conditions. Even for those who don’t usually experience intestinal problems, going overboard on a big bag of sweet cherries can cause tummy bloat, farting, cramps and even diarrhea. Cherries contain a combination of indigestible fiber, sugar alcohols like apples and significant levels of fructose, that, under the right conditions, can be malabsorbed in your gastrointestinal tract. There is also some suggestion that certain people may experience nausea and even vomiting from the antioxidant quercetin found in relatively high levels in cherries. Though unless you know you have an allergy to quercetin, I wouldn’t avoid cherries, or other healthy sources like berries, tomatoes and leafy greens over this. It’s best to enjoy this healthy little fruit in moderation, rather than having too many cherries at once which can lead to difficulty digesting them and excessive flatulence and bloating later on. They are a great source of minerals like iron, vitamins and cancer-preventing antioxidants and having a healthy handful, rather than a whole bag, shouldn’t cause gas problems for most people. 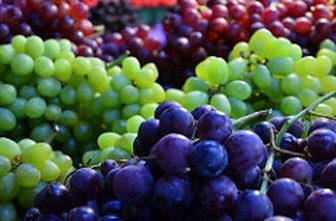 Juicy grapes are another otherwise healthy fruit that can cause gas and intestinal upsets if you eat too much of them. They are very rich in fructose, which is a type of simple sugar that most people get far too much of in the diet these days. At high enough levels, fructose is malabsorbed and eating large amounts of grapes, or particularly grape juice, could easily provide enough of it to cause digestive problems. In fact, packaged grape juice can even cause diarrhea for some people if consumed in excess. If you suspect grapes in particular may be causing you stomach pain, bloating and gas then two other substances they contain could also be the culprits. The first is salicylates, naturally occurring chemicals in the skin of fruits that help protect them against diseases and insects. Salicylates can be found in many foods and most people don’t seem to have a problem with them. Some are sensitive to these chemicals though and experience symptoms like headaches, anxiety and rapid heartbeats when they have too much salicylate-containing foods in their diet. Another potential symptom of salicylate sensitivity is digestive problems and people with irritable bowel syndrome are advised to avoid it as a potential trigger for intestinal distress. Due to the fact that we eat a lot of the fruit’s skin when we eat grapes, they are a relatively high source of salicylates. If you eat grapes regularly and are getting unusual gas and bloating you may want to try a week off from them and see if it helps. Another substance that may cause intestinal pain, nausea and cramps that is found in grapes are tannins. These polyphenols a generally considered healthy, but if you are sensitive to green tea and wine (other high sources) then it may be best to limit grapes to avoid similar problems. Tannin and salicylate sensitivity is quite rare though. It seems most likely that grapes make people fart because they are so delicious that it’s very easy to eat too much of them. With their high levels of fructose, grapes can definitely cause gas if you eat a whole bag of them in one sitting. Like apples, pears are a high source of gas causing sorbitol. They are also full of fructose sugar that can be malabsorbed in the digestive tract and lead to an upset stomach and even diarrhea. In fact, processed pear juice, and other fruit juices like apple and grape, are very heavy sources of fructose, almost as bad as high fructose corn syrup sweetened sodas. It’s far better to avoid packaged fruit juice and make your own much healthier juices instead. Not only to avoid bloating, cramps and other intestinal upsets, but also to avoid putting on body fat. Eating any more than one pear at a time is quite likely to cause gas and pear juice, as a concentrated source of both fructose and sorbitol, should be completely avoided. Mangoes are high in both fiber and particularly fructose and when you eat them you tend to enjoy a lot of them, which can cause problems with flatulence and belly bloating. Like bananas, mangoes also contain a fair amount of digestive resistant starch before they are fully ripened and it turns to sugars. If you’ve experienced a lot of gas or other digestive problems after eating a mango then you may have had one that wasn’t fully ripe. Make sure your mango is quite soft before you open it to eat it and limit yourself to just one to avoid problems digesting it. Pineapple is an interesting addition to this list of fruits that cause gas. On the one hand, it does contain a fair amount of fructose sugar and fiber, both of which can cause flatulence. On the other, it is also a rich source of digestive enzymes like bromelain, which actually helps to break down undigested protein in your digestive tract. Poor protein digestion and the putrefaction of proteins in the colon is the most common cause of those really smelly farts we all want to avoid. The bromelain enzyme is found predominantly in the pineapple core and can help cleave protein bonds during digestion, preventing ‘rotten egg gas’ from ever forming in the first place. If you think pineapple is giving you gas and can’t eat it then you still might benefit from a broad spectrum digestive enzyme with bromelain like this. Take it with any high protein meal to improve digestion and prevent protein putrefaction in the colon. A good source of fiber and potassium for healthy digestion, watermelon can also cause gas, bloating and an upset stomach when eaten in excess. These negative side effects of eating watermelon are due to its high levels of fructose and particularly the sugar alcohol mannitol . People often eat watermelons as a dessert after a heavy meal too, which is the worst possible time to eat them. With their water content, melons digest very quickly and should always be eaten on their own or at least before slow digesting proteins and starches. Honeydew melon and cantaloupe are good low gas alternatives to watermelon as they have less sugar alcohols and fructose. It’s still best to consume these melons on their own though to avoid stomach pain and bad gas. Nutritious berries like strawberries, raspberries and blackberries can also, unfortunately, be a cause of gas problems. Blackberries and raspberries, while very healthy in other ways, are quite high in sorbitol and should be eaten in moderation to avoid bad gas, bloating and possibly diarrhea with excessive consumption. Strawberries are high in fructose and have both sorbitol and fiber that can make you gassy. With their sweet taste, many people tend to rush them down as well without chewing them properly first to help digestion. With all berries, potential issues with salicylates causing intestinal distress mentioned in the section on grapes causing gas may also be relevant. Even though berries like raspberries, blackberries and strawberries can cause gas, they are simply too healthy to recommend avoiding completely. Try eating them in smaller amounts more often, rather than all at once, to avoid them making your stomach hurt. Despite their great taste and otherwise healthy nutritional profile, plums, peaches, apricots and other stone fruits are another potential culprit when it comes to excessive flatulence. Apricots, peaches and plums in particular have some of the highest levels of sorbitol and other gas causing sugar alcohols. Peaches are also full of fructose, though not to the same levels as grapes, pears or mangoes. Nectarines were also shown in this laboratory analysis to have the most fructooligosaccharides of any fruit measured. These complex sugars can aid digestive health but in large doses will easily make you fart too much. While stone fruit like nectarines, peaches and apricots can make you gassy, their mild laxative effect and high fiber means they are often recommended to help you poop. 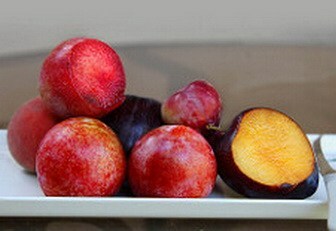 Some medical resources even encourage doctors to encourage patients to use fresh plums and apricots for constipation. Fruits like peaches and apricots are often canned which makes them lower in nutrition, higher in fructose and sugar alcohols, quite unhealthy and definitely a potential cause of excessive flatulence. Canned apples, pears, mango and pineapple are also very gassy foods to eat and often promote bloating, stomach cramps and even diarrhea for sensitive people. It’s best to avoid canned fruit and stick to fresh fruits for their superior health nutrients. Even then, with fruits like plums, nectarines and apricots, it’s recommended to enjoy them in small amounts only to avoid tummy bloating and unwanted gas. Beyond canning fruit, there is one way of consuming it that is even more likely to cause gas and digestive problems – eating dried fruit. When fruit is dried, all of the potential gas-causing compounds discussed, like sorbitol, fructose, indigestible fiber and more are heavily concentrated and made much more difficult to break down in your digestive tract. Dried fruit is quite difficult to digest for most people and unless you chew it really well it will probably end up being broken down with fermentation by bacteria in your colon. The worst dried fruits for gas are dried apricots, figs, plums, dates, raisins and prunes. These products usually have very high levels of sorbitol, fructose and indigestible fiber. Some manufacturers even coat dried fruit with extra gas causing sorbitol powder for some strange reason. It could be argued that for a healthy digestive tract dried fruit can be a prebiotic, feeding the good bacteria in your lower intestine. This is particularly true of organic and unsulphured prunes like these which have been shown to improve digestive health and help prevent colon cancer. But for most people looking for why fruits are causing gas and other intestinal problems like bloating and cramps, dried fruits would be the first to remove from your diet in the process of elimination. If you want to avoid gas from dried fruit then eating them with a broad spectrum digestive enzyme like this one I use is recommended. Otherwise, unless you have a very healthy digestive system, dried apricots and other dehydrated fruits will make you fart later in all but the smallest amounts eaten. If you’d still like to enjoy some fruits without digestive problems, these 5 types of non gassy fruit are the least likely to cause flatulence, bloating and other intestinal upsets. Citrus fruits like lemons, limes, oranges, mandarins, tangerines and grapefruits are usually good low gas fruit options for most people. Lemon or lime juice in water first thing in the morning will also help to improve your overall digestion and assimilation. Packaged orange juice is concentrated sugar and bad for gas. Cantaloupe and honeydew melon are low in both sugar alcohols and fructose, though their fiber may still cause some people issues. Watermelon does unfortunately have quite a bit of sugar alcohol and can be a problem for bloating and farting. In terms of berries, blueberries and cranberries (not dried) are good low gas alternatives and both boast an impressive antioxidant and nutritional profile. Avocados are an excellent non gassy fruit and with their beneficial monounsaturated fats and high antioxidant content are also extremely good for you. Tropical papaya is another great fruit to eat to avoid flatulence and digestive problems. In fact, it contains a digestive enzyme called papain that helps to break down undigested protein and therefore will help to prevent those really smelly farts. My advice would be to not stop eating healthy fruits like apples, grapes, cherries and bananas, even though they may cause you some gas on occasions. Usually, it’s only when eaten in excess that fruits cause gastrointestinal issues like stomach ache, belly bloat and diarrhea. Rather, try a week off from all of the gassy fruits listed here, like pineapple, pears, mangos, strawberries, and especially problematic canned fruit and dried fruits like apricots. Then, once you’ve taken this break, slowly reintroduce them one at a time and see how they affect you. Eat only that particular fruit on its own at first, in a decent amount and away from other foods, and you should be able to identify which fruits give you an upset stomach and cause the worst bloating and flatulence for you personally. Once you’ve identified a particular fruit that causes you gas you can still choose to eat it by taking a comprehensive digestive enzyme like this that breaks down sorbitol, fructose, indigestible fiber and other problematic substances in fruits before they can cause intestinal problems later on. I hope this list of both gas causing fruit and non gassy alternative fruits has been helpful and would appreciate if you could share it to help other people out there. Few people know that healthy fruits can cause digestive problems, but identifying the particular fruit that causes gas for you is the first step in fixing the problem.